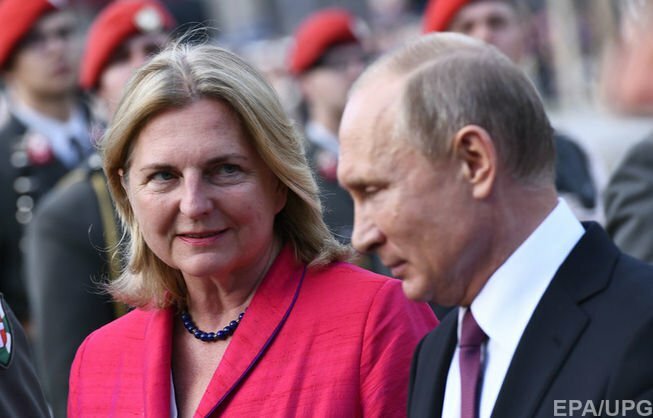 The motorcade of President Vladimir Putin arrived in the Austrian commune Gamlitz, where the ceremony of marriage of Austrian Foreign Minister Karin Kneissl and Wolfgang Meilinger will be held, Reuters reports citing OE24.TV Internet channel. Austrian media reported that the Russian leader would get to Gamlitz from the airport of Graz by helicopter, but Putin preferred the car. For the passage of his motorcade, the highway leading to the commune was closed. By the time of Putin's arrival, other high-ranking guests have already gathered for the celebration: Austrian Prime Minister Sebastian Kurz, Vice Chancellor Heinz-Christian Straсhe, President Alexander Van der Bellen and OPEC Secretary General Mohammed Barkindo. We recall that after the solemn event, the Russian president will go to negotiations with German Chancellor Angela Merkel. Note that after criticism from the Austrian media, the Austrian Foreign Ministry said that the arrival of President Putin is "a personal visit to a private holiday, which does not indicate a change in the country's foreign policy position." The head of the Ukrainian Foreign Ministry, Pavlo Klimkin, said that the invitation of Putin to the Foreign Minister of Austria's celebration "provokes a sad smile."